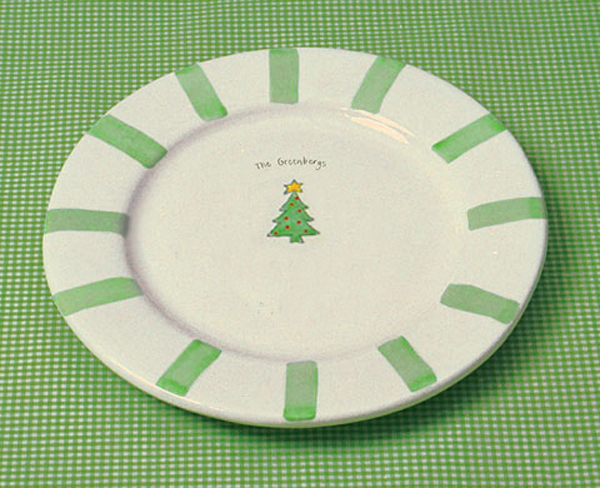 Celebrate a family Christmas with your own personalized Christmas Platter. Also makes a great gift for bringibg someone this holiday. This memorable keepsake Christmas Platter will make Christmas fun. 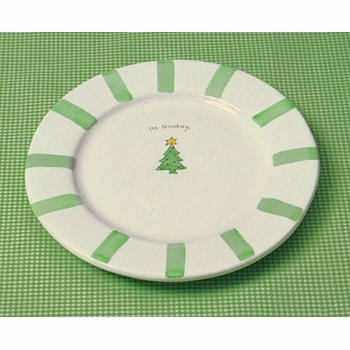 Platter is 13.5" in diameter with hand-painted green stripes radiating around the rim. In the center is as whimsical illustration of a Christmas Tree with a big yellow star. Add any text you wish to make this platter one of a kind, to be treasured year after year. Such a sweet and personal gift for a new family! Hand washing is recommended. Use in microwave is for warming only.